A liquid fertiliser that provides calcium and sulphur nutrition for vegetables, fruits, vines, flowers, turf and ornamentals. 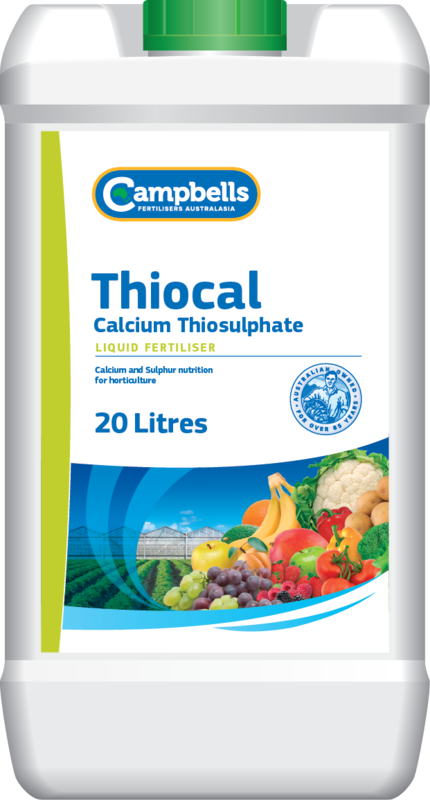 Campbells Thiocal supplies the plant nutrients calcium and sulphur, available for plant uptake. Thiocal is a true solution and is at least 500 times more soluble than Gypsum and therefore means it not only supplies plant nutrients, but acts as a soil amendment that can be used to improve water penetration and leach harmful salts from the root-zone. Where salt (sodium) issues are more serious, consider using Campbells Thiocal in conjunction with Campbells Saltero. Campbells Thiocal is ideally suited to fertigation programs – where Calcium Nitrate applications are incorporated into early development of the crop and where calcium is an ongoing requirement that can be supplied with Thiocal. General rates for horticultural crops are between 20 – 50 L/ ha, repeating at regular intervals throughout the season, as necessary (ideally apply during middle 1/3 of the irrigation period). The actual rates, number of applications and their timing will vary considerably for different crops and for different districts. Before application, seek advice from your Campbells Thiocal distributor or your local agronomist.